HOPE Organizing turned 10 in the spring of 2017! 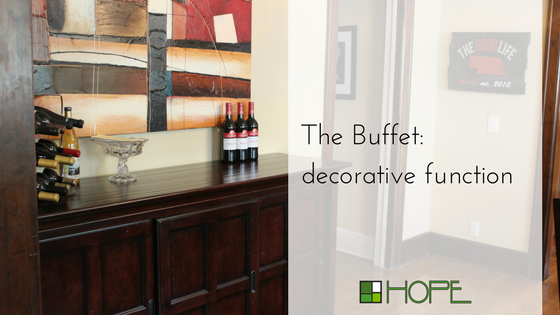 To celebrate, I invited clients, potential clients, friends, and family to an Open House in September. This was a true “open house” in that I let people look inside almost every closet, drawer, and cabinet in my home. Over the course of several posts, I will let you into my home and see how I organize my own space. My HOPE is to give you the inspiration to take on something that is really challenging and make one step to either give you peace of mind or save you time and/or money! 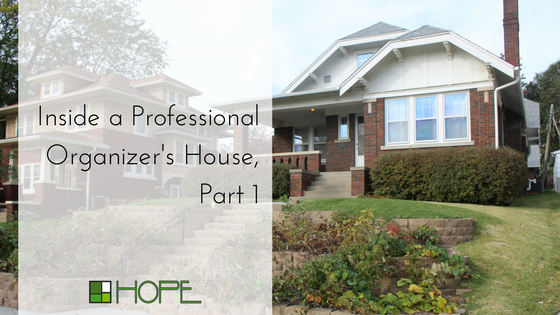 I wanted to do the “open house” not only as a way to celebrate my business but also as a reason to tackle a few of the spaces in my own home that were not organized the way I wanted and not really functioning for me. In fact, writing this blog is a big challenge for me because I have tons of ideas but hate the writing part! But by making this a several-part series, I am taking on a challenge and committing to completing it. Welcome to the 90-year-old home that Bruce and I (fell in love with!) 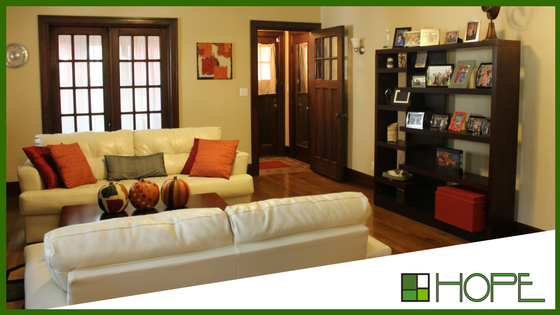 purchased in 2011 after it was completely remodeled/rehabbed. We love living in an established, diverse neighborhood that allows us to walk to many fun activities. Our son Anderson joined the family in early 2016, and he has most definitely made a difference in how almost everything around our house is organized and just “lived” in. 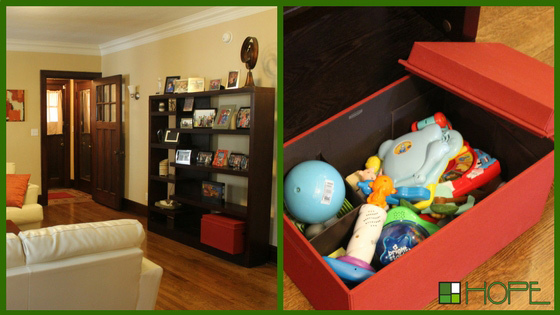 As you come into our home, you will notice the first collection of family photos and Anderson’s toys. Anderson’s toys are hidden away in the Rubbermaid Bento Box! Sometimes, I try to organize his toys into categories within the box, and then I realize there is really no point as it will probably be destroyed when I turn around. Within the built-in bookshelves, we keep mostly memorabilia like my yearbooks, items from our travels and some items from our grandparents. Almost every item or knick-knack has some kind of meaning to Bruce or me. When we travel, we try to bring home a piece of art we can display that will remind us of our adventures around the world. In fact, almost all of the art in our home is one-of-a-kind or limited edition. We like having something special that is not just a dust collector. We think this corner shelf was built for the telephone back in the day, but now it makes a great cookbook corner! We were able to get rid of everything that didn’t fit into that corner, too. (The point is: give yourself a limit!) Let’s be honest: most of our recipes are found online and we typically only use the books with old family favorites. This is the honest, lived-in truth about a professional organizer’s house: things get messy with day-to-day life, BUT things can be organized and have a “home”. To prepare for this post, I was able to put everything away to get the pictures above in about 8 minutes! Love the cookbook corner! A practical and relevant new use to an old space! Thanks for showing us around! 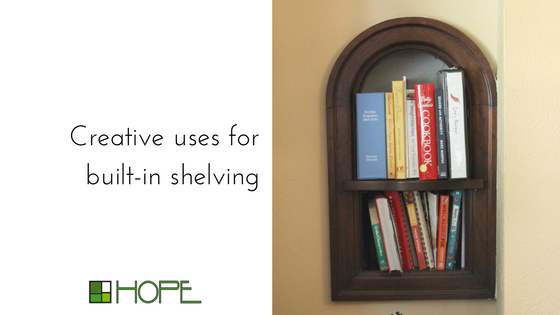 Thanks, Kathy – It is such a great way to limit the number of cookbooks. I can see why you fell in love with this house. It’s so much more charming than most of the houses they build these days. And I love that all of your art and knickknacks have special meaning for you. It’s a fun idea to share your home with your readers. It makes a personal connection. Thanks, Sheri – It’s all about me be totally authentic in my business. Such a cute home! It is a wonderful feeling to know you are under 8 minutes away from having your belongings put away. It does get tougher when you have others in your space… I’ve had to create some “zones” for my husband so that we don’t argue and I don’t drive him crazy. Very bold to open your home, but I know many will enjoy this. Congratulations on 10 years! Thanks, Seana – It can be difficult to keep things organized when sharing a space (especially one person is a two-year-old. Congratulations on your 10 year anniversary…and what a wonderful and creative way to celebrate it! Your house is wonderful and I can see how much love and care you’ve added to every corner. Thanks Linda! I really try to think about every little corner and if something is really needed. Great idea — you’ve inspired me to do the same with the storage spaces in my RV! Thanks Ramona! Posting about my own home is making me be even more organized because I am welcoming people into my home to see the space. Thanks Deb! The built-ins are so awesome on one of the reasons we fell in love with the house. I LOVE the bento box idea! Thanks for sharing the link! Still a huge fan of everything you do! I LOVE the Bento Boxes – they are so versatile!